Try these practice tests for FCE Reading and Use of English. Get a printed version of each test for a record of your work. 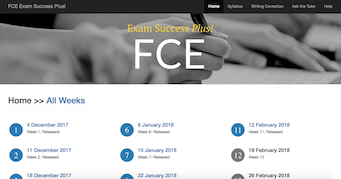 Looking for more FCE Reading and Use of English practice tests? If the test tells you your answer is wrong but you think you're correct let us know. Print a copy of the test to read offline then use the interactive version to answer the questions. If you score badly, don't worry! Try our grammar and vocabulary-building exercises in Spotlight Paper 1. Go to our FREE Word Bank for daily vocabulary exercises to help you with the Use of English paper. "The reason I am writing you is to simply thank you for your support. Your sample tests and exercises are helping me very much. Thank you again and congratulations for having created such a wonderful site which I must say is very professionally designed"
"Thanks very much for all tests. I am happy with flo-joe. I thank all of you."